HomeMore single rooms = less acquisition. A simple equation? More single rooms = less acquisition. A simple equation? This isn’t exactly hot off the press (published in 2011) but I’ve only just come across it; it’s a great article and worth revisiting. Many hospitals worldwide suffer a chronic lack of single rooms to place patients requiring contact precautions, but also for patients with other needs such as increased privacy and dignity. There are pros and cons associated with increasing the proportion of single rooms, with a high proportion of single rooms usually requiring a higher staff:patient ratio, and patients in single rooms often having less staff contact and more likely to suffer feelings of isolation. The evidence that an increase in the proportion of single rooms reduces the transmission of healthcare-associated infection has been somewhat equivocal. This Canadian study evaluated the impact of ‘privatization’ of an ICU. In March 2002, a 24-bed ICU (comprising two 10-bed rooms and four single rooms) was moved to a new 100% single room unit. A 25-bed ICU in a sister hospital (comprising 2, 5, 6 or 8-bed rooms) did not undergo any change in configuration and served as a comparison unit. Importantly, the two units shared the same infection control team, policies and practices. Patients admitted between 2000 and 2005 were studied for the acquisition of a range of pathogens. A unique and useful aspect of the study was to divide microbes into likely endogeneous or exogeneous acquisition. The key result reported was the change in rate ratio of the intervention ICU compared with the comparison ICU before and after the date of privatization of the intervention ICU. This was effectively an estimate of the percentage reduction in the rate in the intervention hospital associated with privatization. 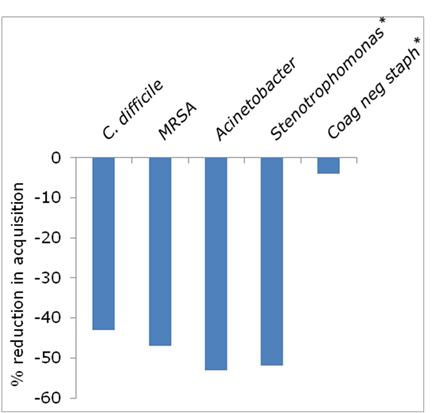 Significant reductions where shown in most pathogens associated with exogenous acquisition, including C. difficile (43%), MRSA (47%) and Acinetobacter spp. (53%), and a substantial but non-significant reduction in Stenotrophomonas maltophilia (52%) (Figure). In addition, a combined analysis of C. difficile, MRSA and VRE also showed a significant reduction of 54%. Significant reductions were also shown for some pathogens in the exogenous/endogenous acquisition group, including Klebsiella spp. (38%). There was no significant change (4%) in the rate of coagulase-negative staphylococci and most other pathogens associated with endogenous acquisition. Perhaps not surprisingly, the authors also reported a reduction in the overall length of stay associated with the intervention. As with all studies, this one is not without criticism. However, there are several aspects that I find particularly convincing. Firstly, whilst there were differences in the configuration of the two ICUs, the inclusion of a comparison unit was an important strength. Secondly, the authors evaluated all available pathogens, rather than focusing on an individual MDRO. Thirdly, and perhaps most convincingly, most pathogens associated with exogeneous infections were affected by the intervention whereas most pathogens associated with endogenous acquisition were not. Additional strengths include several “data-check” sensitivity analyses and an additional model to provide evidence that these were not transient reductions associated with moving to a new, clean unit. Many if not all of these important strengths are lacking from similar studies that have returned a negative result. The simple equation that more single rooms = less acquisition of pathogens is firmly supported by this study. However, infection rates are not the only factors to be considered when contemplating a move to 100% single rooms. Staffing levels, patients views and up-front costs must be factored into the decision to move towards 100% single rooms. Teltsch DY, Hanley J, Loo V, Goldberg P, Gursahaney A, Buckeridge DL. Infection acquisition following intensive care unit room privatization. Arch Intern Med 2011;171:32-38.